The Financial Services Modernization Act (formally known as the GLB), authorizes the Federal Trade Commission (FTC) to write rules regarding consumer privacy, safeguarding consumer information, record retention and fraud detection. Dealers are required to explain their information sharing practices to their customers. In turn, their customers have the right to limit some – but not all – sharing of their information. 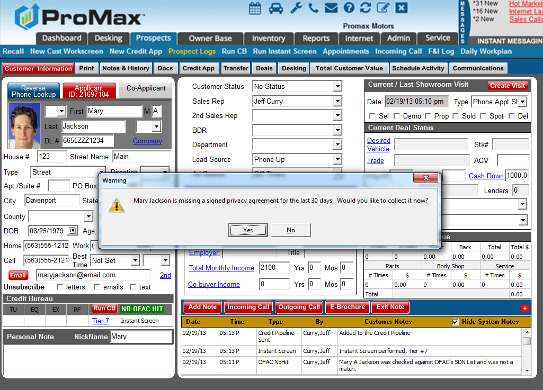 When utilizing ProMax, you have unlimited access to our clear and professional looking Privacy Notice. When personal information is collected, the software automatically prompts the user to print a notice. 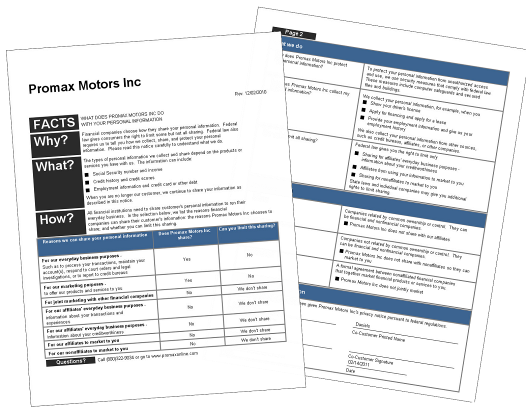 In accordance with the GLB, the ProMax Privacy Notice is customizable to your dealership to reflect your information sharing practices, along with the consumers ability to limit this sharing. Given the emphasis both Federal and State Regulators’ are placing on privacy related issues and the current regulatory environment, you can’t afford to be unprotected against customers falling through the cracks. ProMax offers a seamless and streamlined solution to the Privacy and Safeguards Rule requirements. Automatic Prompt to Print Notice! Users are automatically prompted to print a Privacy Notice. When printed, the transaction is recorded in the Customer Workscreen, date and time stamped for reference. In compliance with the GLB, the ProMax Privacy Notice is clear, conspicuous, and reflects accurate statements of any dealer’s privacy practices. Each reason for sharing customer information is customizable to reflect your information sharing history. Who information is shared with and whether the consumer can limit the sharing is individually configurable. The ProMax Total Compliance Solution takes care of all your automotive compliance needs.